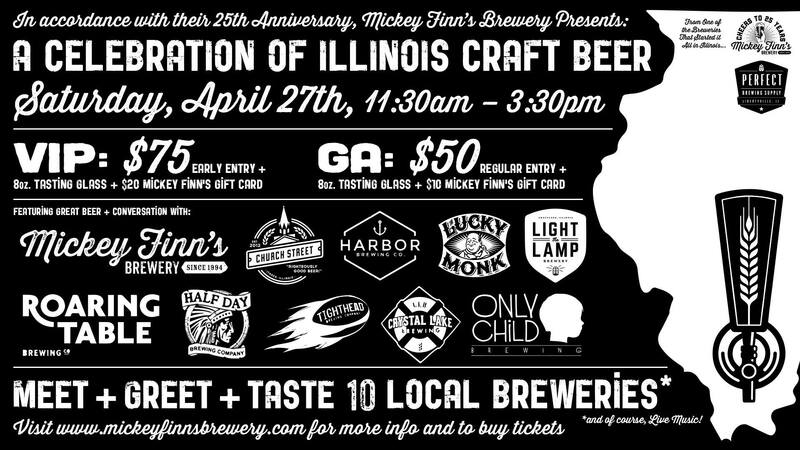 Mickey Finn’s, Illinois’ oldest brewpub, is celebrating with a beerfest featuring a bunch of great local breweries. This boutique event will feature more than10 local brewers with a meet and greet with many owners and brewers. Limited to first 200 people to sign up. VIP’s ($75) receive an 8oz tasting glass, early entry (11:30am) plus a $20 Mickey Finn’s gift card (good for food, beer or swag). GA ($50) tickets receive the tasting glass, entry and a $10 Mickey Finn’s gift card. Sponsors Perfect Brewing and Mickey Finn’s – present the following guest breweries – Tighthead, Only Child, Crystal Lake Brewing, Roaring Table, Light the Lamp, Half Day Brewing, Church Street, Lucky Monk, Harbor Brewing and of course Mickey Finn’s – just to name a few.